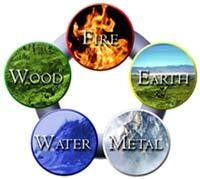 The theory of five elements appeared more than three thousand years ago. In addition to "Yin" and "Yang" - feminine and masculine principles - Chinese philosophers divided our world into five pillars, or five elements of the universe. These ele ments represent the fundamental principle of life. It is of this elements (of their right or wrong combinations) our world is made. These are the fundamental energies of the universe, the forces of Great Cosmos, which correspond with each and every area of human life, and every phenomenon of the universe is the result of the interaction of these five elements. They seem to be enclosed in a single cycle, which is constantly repeated, and the power of each element is first increasing, then falling. Chinese tradition says that the lives of different people certainly differ from each other, including the fact that each of us is representing individually, the relationship between these elements. On this basis, each person can be attributed to one group or another and give a characterization based on the predominance of one or another element. We can say that these five elements of the universe are connecting people with the whole world. On the basis of this interaction,?? Chinese scientists have created a perfect system. The very essence of that system is that the interaction occurs in the universe, and in each person individually. It is the Law, one for everyone and everything. The influence of the five elements on each other gives a rise to two cycles: the cycle of birth and the cycle of destruction. When you begin to attract the vital "Qi" energy to your house, you definitely need to take into the account your own dominant element to avoid any mistakes in the future, because it is a very necessary thing to consider in order to properly harmonize the living space. The meaning of the generation cycle is that one element is generating another, and the meaning of the destruction cycle - one element destroys the other (ie just the opposite). So, in the cycle of generation Fire generates Earth, Earth produces Metal, Metal produces Water, Water nourishes Wood, Wood is feeding Fire. To create a harmonious atmosphere at your home, you need to build a chain of being. But if the direction is changed, we are getting the opposite result, ie cycle of destruction. Wood loosens the Earth, Earth pollutes Water, Water extinguishes Fire, Fire melts Metal and Metal is cutting Wood.